For Engineering | KORAL s.r.o. Koral Ltd. provides geophysical support of engineering-geological surveys for the creation of individual buildings, housing complex and industrial construction. Geophysical surveys for line structures (highways, railways, pipelines, oil pipelines, dams, sewage …). Assessment and determination of the size of the slope deformations (identification slip surface) for nicks and cuts off communication. Survey to remedy landslides and emergencies caused by engineering geological factors. Pyrotechnic research in planning structures. Evaluation of radon risk area. 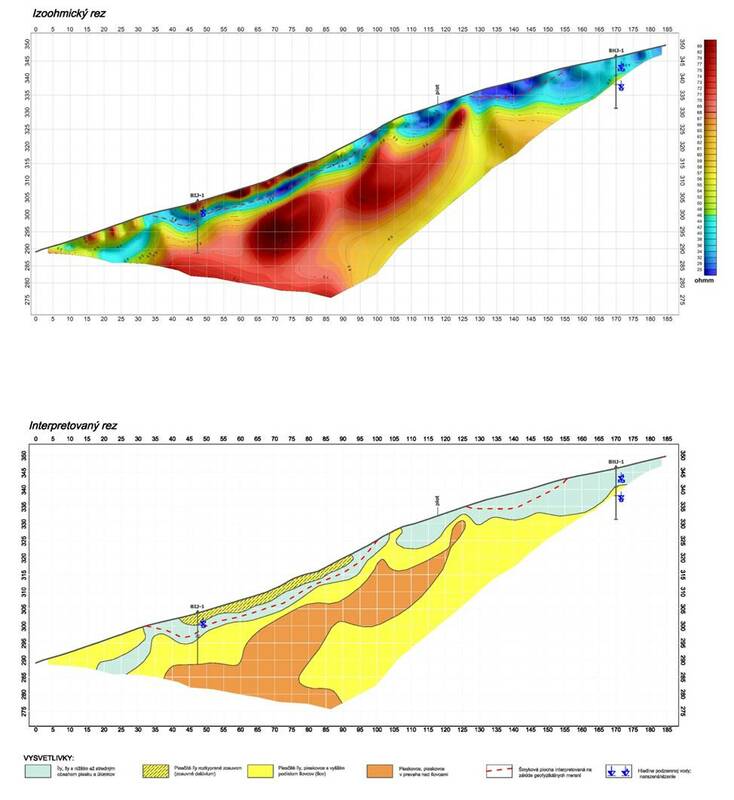 Logging survey in engineering – geological drilling (rock interface, disruption of rocks, thermometry, resistivmetry). Knowledge of the geological structure, known mostly from geological drilling, should be supplemented by geophysical methods. The most appropriate detailed geophysical method (fig.1) is method of the resistance tomography (multicable). By this method is possible using the multi-electrode cable in one process to measure studied profile in several layers, according to the specified depth range, with the chosen density of the step measurement from 1-5 m. By interpretation of geophysical measurements, detailed geological profile, verified geological drilling, is achieved. Radon 222Rn is the most important source of natural radiation. It has high ionization ability and can cause tissue damage with subsequent development of lung carcinoma. Radon from soil passes into residential areas through the cracks and other leaks.